Is Inhofe Connected To ORU Scandal? It should surprise no one that U.S. Sen. Jim Inhofe’s name has surfaced in connection with the ongoing Oral Roberts University scandal in Tulsa. Inhofe, a former Tulsa mayor, was mentioned in a recent Tulsa World article that published excerpts of emails allegedly written by Stephanie Cantees, Richard Roberts’s sister-in-law. Cantees served as an advisor to Roberts, who recently resigned as ORU president amid allegations he and his family misspent university money to fund a lavish lifestyle. The emails were addressed to Roberts, according to the article. The emails seem to support claims by a former ORU professor that “Roberts ordered students to participate in Randi Miller’s mayoral campaign,” according to an attorney for the professor, the article states. According to the article, Miller, who lost her 2006 election bid, said she entered the race after discussions with Inhofe and Roberts. One of the emails obtained by the World refers to an alleged meeting between Roberts and Inhofe about the mayoral race, but Cantees’ attorney denies she wrote it, the article states. The issue is whether Roberts politicized the university and students, risking the schools nonprofit status, with the help and influence of Inhofe. Did Inhofe actively participate in trying to make the university a partisan, GOP political organization? If so, did his actions lead to IRS violations at the Christian college? The senator needs to come forward and explain his relationship with Roberts and the school. 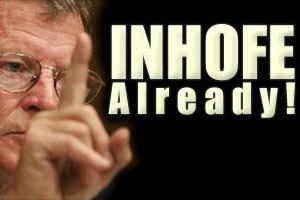 Inhofe, 73, repeatedly embarrasses the state with his ongoing war against modern science. State Sen. Andrew Rice (D-Oklahoma City) is running against the vulnerable Inhofe in the 2008 election.